Sepia-toned image of a man from the shoulders up. He wear a baggy, dark suit with large lapels. His hair is long over his hears and combed straight from the middle, and he has a full, somewhat forked beard. [back] [ink] To Hon. 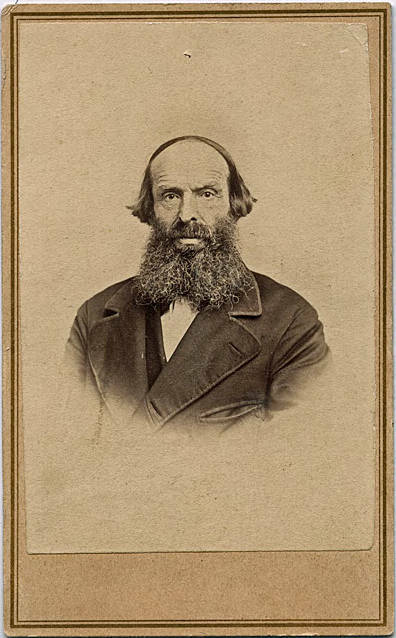 T. R. Cornelius from his sincere friend, H. H. Spalding born in Steuben Co., N. y. 26 Nov. 1803. Educated at W. R. Col. & Lane Sem. A. ordained by Bath Pres. N. Y. 1835 and placed with wife missionary of AB. 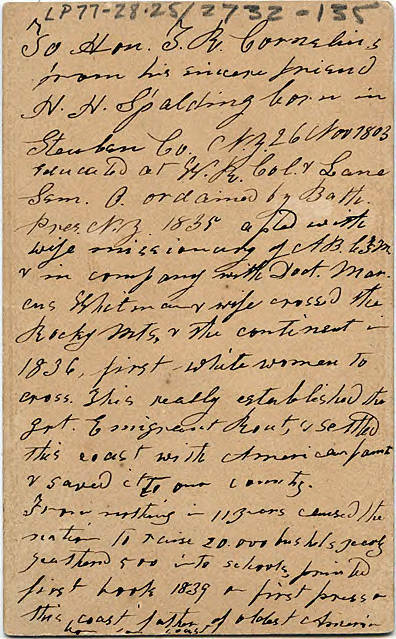 [sic] C. F. M. & in company with [illegible] Marcus Whitman and wife crossed the Rocky Mts & the continent in 1836, first white women to cross. This really established this grt immigrant rout [sic], & settled this coast with American families & saved it to our country. From nothing in 11 years caused the section to raise 20,000 bushels yearly, [illegible] 500 into schools, from the first look 1839 and first press on this coast father of Oldest American [illegible] in coast.